Another adventure in the In Death series. Last year I caught up in the Women of the Otherworld series and felt very proud of myself. This year I would like to make a dent in this series. I hadn't read it since 2007, but I own almost all the series from the second-hand store. Reading two books in the series in one month is a lot better than I was doing! Hopefully I can keep it up and carry on with the series. I might not finish it this year, but even getting a few read is a big accomplishment. I probably have too many things I would like to accomplish in 2011, but even if I get some of them done I will be happy. This book opens with the murder of a cop working in a private club for extra money. When it is one of your own, it makes things a lot harder for the cops investigating. Eve is a professional, though, and handles things really well. She is the last voice for those that have died and she is determined that by the end the voice will be heard. In the previous book I was rather surprised by the turn of events in the book, but in this book I had it pretty much figured out early on. It still was an enjoyable read and I am always looking forward to seeing if I am right. This book also had a lot of character development for Eve and Roarke's marriage. It is nice to have those personal touches worked into the book and I hope that they continue. When everything started to get wrapped up it also worked well. I like Roarke, but we are well-aware that he is not perfect, so it was worthwhile to see traces of his past in this book. Once again it was an enjoyable read that I am glad I finally got around to. I enjoy Eve, Roarke, and the secondary characters. Doctor Mira, a recurring character, was in this one and I found her rather funny! I also enjoyed the case and watching it play out. Robb reads real page-turners and keeps the readers interested until the very last page. I am glad I am spending time with this series and its characters this year. This counts for the Sci-Fi Experience hosted by Carl at Stainless Steel Droppings. 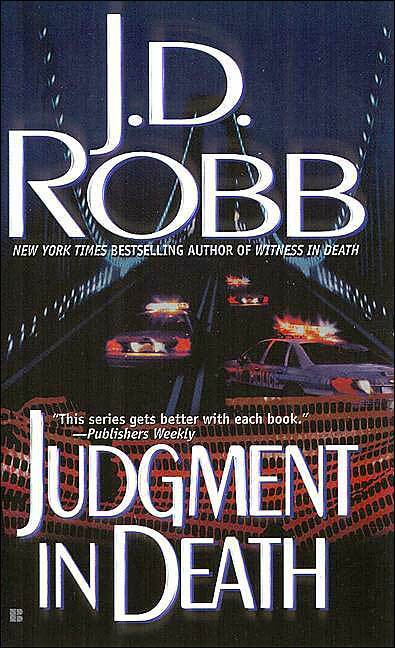 I've not read anything by JD Robb (wow- LOTS of words used in conjunction with "in death), and didn't know it was a sci-fi series. How interesting! Will have to look more into it. I'm glad to hear that you are enjoying this series once again. I've yet to pick up one of these books this year but I have the next 3 patiently waiting for me on my shelves. Hope you continue to enjoy! This is a series I've neglected for a while. I think it's because there are so darn many of them that there's no hope I'll ever catch up. I do enjoy the series. I've grown to really enjoy the secondary characters as the series has progressed - Dr. Mira and Peabody are my favorites. I'm not a big sci-fi fan, but the way the futuristic stuff in these book is mixed with enough that's still familiar makes them fun. I really need both an autochef and the shower in Eve and Roarke's house. Maybe I'll take the next one for me (Purity in Death) along on my upcoming vacation. Yay! You will soon be catching up to me! Samantha: I am hoping I will continue to enjoy, too!